Brook Lopez – Copyright 2019 NBAE (Photo by Gary Dineen/NBAE via Getty Images). The Milwaukee Bucks opened 2019 with another victory. With a 121-98 win over the Detroit Pistons at Fiserv Forum, the Bucks capped off the night with the best winning percentage in the NBA. 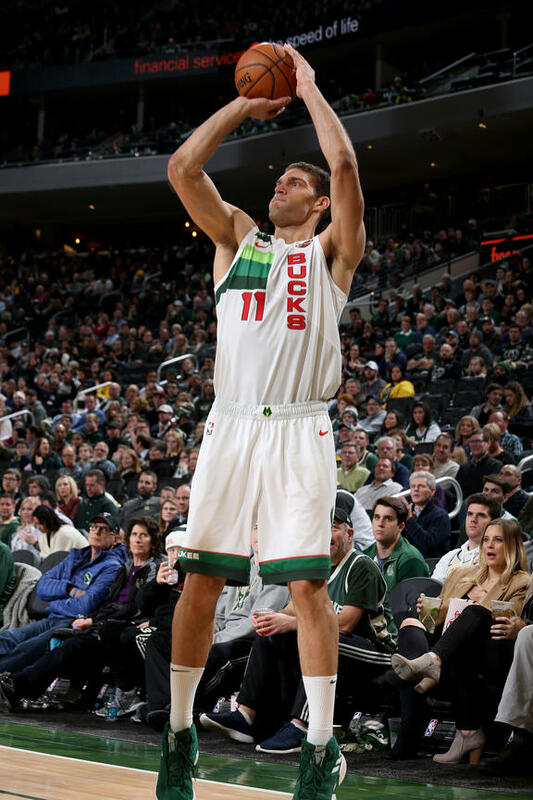 Center Brook Lopez hit seven three-pointers (7 of 12) and led all five Bucks starters in double figures with 25 points. Khris Middleton added 22 points for the Bucks, who won their fourth straight and seventh in the last eight games. 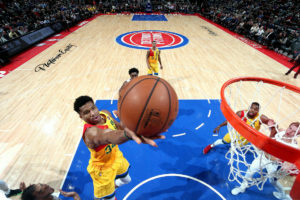 Blake Griffin finished with 29 points and Reggie Jackson added 19, but the Bucks held the Pistons to 38-percent shooting from the field. The Bucks had a big shooting night, hitting 70% from the field in the first half and 59.5-percent for the game. The Bucks get a couple of days off. They’ll host the Atlanta Hawks and Toronto Raptors on Friday and Saturday nights. 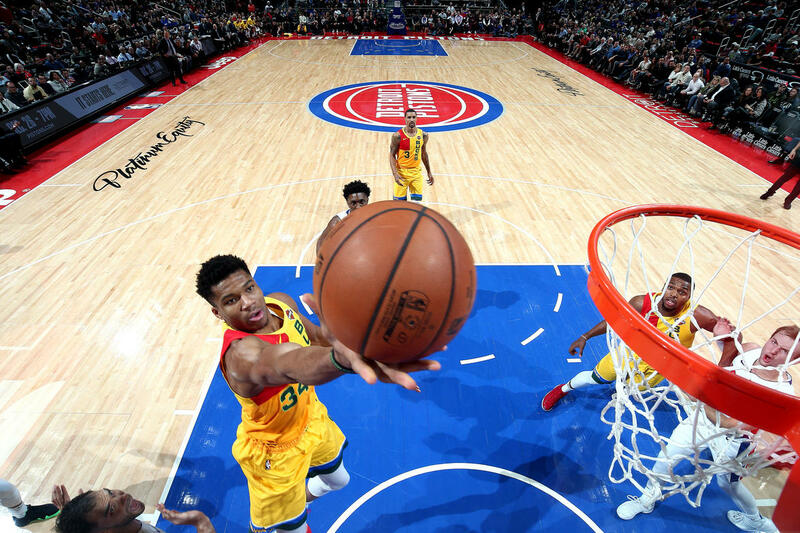 Giannis Antetokounmpo poured in 32 points and pulled down 12 rebounds to help lead the Milwaukee Bucks to a 107-104 win over the Detroit Pistons at Little Caesars Arena on Monday night. Twenty-four of Antetokounmpo’s 32 points came in the second half. The Bucks led by 15 in the third quarter, but the Pistons made a run to get back in it and the teams went back and forth the rest of the way. Then in the closing minutes, Giannis took over with three clutch baskets and the Bucks held on for the win. Khris Middleton added 22 points and Eric Bledsoe had 17 points and nine assists. Blake Griffin had a triple-double for the Pistons with 19 points, 11 assists and 10 rebounds, but he hit just 4 of 13 from the field and committed 10 turnovers. After Giannis Antetokounmpo got into early foul trouble, it was D.J. Wilson and Sterling Brown that held Griffin in check the rest of the night. Wilson finished with nine points on 4 of 5 shooting from the field and added three rebounds and three assists. His opportunity came after Ersan Ilyasova suffered a nose injury during practice. The Bucks also played again without Malcolm Brogdon, who missed his second straight game with left hamstring soreness. The win is number-20 on the season for the Bucks, who didn’t secure their 20th win until Jan. 3rd last season. They also improved to 7-1 against Central Division teams this season. They finished 6-10 against the Central Division last year. Next up for the Bucks is a home game on Wednesday night against the New Orleans Pelicans.